Can Cherry give Italian Chicken the boot? Will Jalapeño Popper say buenos noches to Potato Egg and Cheese? It is Round 3 of the Inaugural Kolache Factory Invitational Tournament time! 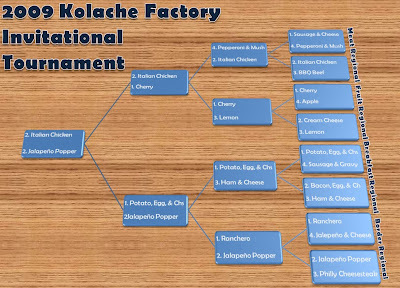 In spite of unfavorable weather conditions (better known as any unconditioned space in the middle of the summer in Houston), Round 3 of the 2009 Kolache Factory Invitational Tournament went down last Thursday evening. This undersized poultry concoction narrowly edged BBQ Beef in the opener and cruised past a Pepperoni & Mushroom that still had a hangover from its grand upset of Sausage & Cheese. The announcement of Cherry as a #1 seed in the Fruit Region was not without controversy. I reported that the fruit was overrated, but Cherry proved me wrong by thwarting a strong effort by Apple and handling the sweet goo attack of Lemon. The mammoth starch-in-starch breakfast beast sent Sausage & Gravy packing and held off the unorthodox Ham & Cheese to claim the Breakfast Region title. Some have contended that it benefited from not having to face a kolache that packed bacon in its arsenal, but I can assure you the P-E-C is the real deal potato peel. It was a pre-tourney Cinderella pick. It was the inspiration of this tournament. It isn’t even on the menu anymore. With all that hype, would Jalapeño Popper show up for the tournament against the best Kolache Factory has to offer? Just ask Philly Cheesesteak and Ranchero. These are two tough competitors. But when they met the Popper… boom goes the dynamite. As with the previous rounds, new predetermined judging criteria will be introduced for this round. Once again, the round will be scored, and the highest scoring kolache in the matchup will advance. The scoring categories are detailed below. Speed Eating (a.k.a. how fast can one be eaten) – In case you missed the breaking news on TheFerm.org’s Twitter feed, I was selected to compete in the International Federation of Competitive Eating’s Kolache Factory World Kolache Eating Championship. The event will be held in Houston, TX at Minute Maid Park after the September 4th Astros v. Phillies game. This criterion was actually selected for the semifinals before I knew I would be competing. While I will no doubt practice a few times before September 4th, dipping and cramming was not allowed in this round of the KFIT... needless to say, this is a tournament that celebrates the looks, textures, and flavors of the kolache. Joey Chestnut is a competitive eating living legend, but I'm guessing he wasn't enjoying the flavor complexities of the 56 Sausage & Cheese kolaches he downed in the previous Kolache Eating Championship. Taste – No fancy math or rules here… each kolache will be scored based on overall flavor. The Saint Arnold Brewery unknowingly played host to the KFIT Semifinals (well, Brock did stop by to ask what the heck we were doing with all those kolaches). The rather conspicuous Speed Eating portion was performed first. I brought my Flip Mino HD along and we documented the event. Enjoy our video presentation of the Speed Eating portion of the competition. Cherry acquired the top eating slot through the draw, which turned out to be a blessing and a curse. Clearly the judges, having not eaten since lunch, were hungry and ready to go all “dessert first” on this kolache. However, being inexperienced speed eaters, overzealous bites and the sticky goo slowed the disposal of the Cherry filled kolache. A surprise hidden pit in my kolache also caused a temporary pause in my consumption. Italian Chicken drew the last spot eating spot. I’ll be honest, none of the judges were enthusiastic about taking down a 4th kolache, making it’s matchup against a kolache in the one hole even more unlucky. As a petite as less sticky kolache, Italian Chicken could have maybe taken the top score. Given the circumstances, it still performed quite well. When people think of Cherry, they think cherry pie. The cherry filling used by Kolache Factory is quite tasty and is very reminiscent of pie filling. However, I also think you have to go into this not thinking you are getting a cherry filled donut. Kolaches are breadier… or is it more breadiest. The judges liked the filling, but Cherry took a little score hit for overall kolache flavor. Italian Chicken is a small kolache with an inconspicuous filling (not colorful at all). But don’t turn your back on the Chicken. This little guy is bursting with cheesy, chicken’y, herb’y flavors. "Outstanding," noted one of the judges. "Fugetaboudit," responded Italian Chicken. Cherry had speed on its side Thursday night. But speed was not quite enough to overcome Italian Chicken’s mysterious tasty goodness. The Popper drew a fortunate eating spot. The 2 spot catches the eaters with a little more experience and while they are still a little hungry. The judges found The Popper to be a little sticky in the mouth with all that cream cheese. The bacon pieces couldn’t be chewed, so they just had to ride down the hatch with the bread of cheese filling. Just a post eating note, none of the judges noticed any spiciness from the jalapeños... until several minutes after the kolache was gone. P-E-C is like an offensive lineman competing in a 200m dash. Conquering the beast, er P-E-C, was a challenge. I used the break up and attack method, while the other judges used a conservative biting method. All the judges passed the 2 minute mark eating this one. Ugh. On the surface, Potato Egg & Cheese is a simple breakfast concoction. However, a peek inside reveals south of the border influences. Jalapeño Popper once again finds itself in another border battle, but it is a battle tested kolache. Judges noted its near perfect blend of flavor and spiciness. The Popper’s use of bacon tops any other bacon combination at Kolache Factory. Potato Egg & Cheese delivered in the favor category as well. Judges lauded the overall taste, noting the uncredited ingredients really contribute favorably to the kolache. But was this the border clash it was billed to be? "I didn’t see this as a border inspired food issue," The Popper insisted. "P-E-C may have wanted to stir up some emotion, but we just do our thing. We let our bacon hypnotize you while the jalapeños score on you at will." When asked if the P-E-C’s southwestern influences created any confusion, The Popper responded "I grew up with eggs, potatoes, cheese, tomatoes, onions… all of them. Heck, I had potatoes and ranchero eggs for breakfast!" Someone was bound to catch Potato Egg & Cheese. It won the Breakfast Regional on a coin toss and tied the taste portion of this Semifinals. Unfortunately the reason why I often pick the P-E-C up for breakfast ended up being the reason why it lost in the tournament: size. The results mark the second numerical upset, with both #1 seeds falling to #2 seeds in this semifinal round. Both Italian Chicken and Jalapeño Popper will travel to (what someday may be) a kolache’s most hallowed grounds. On September 5th, 2009, the KFIT finalists will head to Austin, TX to battle during a tailgate for the beginning of the college football season at The University of Texas. The competition will once again involve taste and will include a Saint Arnold beer pairing category. "This is great exposure for our kind," noted Jalapeño Popper. "We feel right at home with tailgates and beer. Maybe this will put us on the map… or menu." "We certainly have a lot of respect for this tournament and our competitor," Italian Chicken added. "Our pals Vito and Big Poultry are already heading to Austin to learn a thing or two about a thing or two regarding the finals venue. I’m not saying we have this in the bag, but I’m just saying."